Located in the very heart of China’s territory and including most of the middle reaches of the Yellow River, Shaanxi Province is one of the birthplaces of Chinese primitive human beings and national culture. It has also been the political, economic and cultural center of several dynasties in the country's history. It is from here that Chinese civilization first spread out to the outside world. It is also a sacred place of the revolution in the country's modern history. All in all, this province plays an important role in the existence and development of the Chinese nation as well as in human history. About 800,000-1,200,000 years ago, Lantian Man had already lived their lives on this land by using simple tools, collecting fruits and seeds as well as hunting animals. The Banpo Ruins, a representative site of matriarchal clan society dating back 5,600-6,700 years ago, was found in the eastern part of its present capital city, Xi'an. When China’s first dynasty, Xia Dynasty (21st -17th century BC) was built, the Bao State, Hu State and Luo State were set up here. When the first unified and power-centralized dynasty of China, Qin Dynasty (221 BC - 207 BC) was founded, its capital was chosen from this land. Later, several other dynasties, such as the Han Dynasty (206 BC - 220) and Tang Dynasty (618 - 907), set up their capitals on this land, specifically the province's capital city, making it a world famous ancient capital city. Shaanxi Province can be divided into northern, central and southern parts, differing in geographical, historical, cultural and climatic backgrounds, etc. Located to the north of the Beishan Mountains, Northern Shaanxi mainly consists of the Loess Plateau and Maowusu Desert and has a temperate subarid climate. It was an important frontier stronghold in ancient times as well as one of the country's sacred places of the modern-day revolution.. It boasts historical relics like Zhenbeitai of the Great Wall and revolutionary relics like the Site of the Former Offices of the CCP Central Committee -Yangjialing. The famous cities here are Yulin and Yan’an. Central Shaanxi, or Guanzhong, is located to the south of the Beishan Mountains and north of the Qinling Mountains. It enjoys a temperate monsoon climate. Most of its landforms are plains and terraces. This is a place of deep national culture and rich historical relics, especially the ‘living history museum’, Xi'an itself. Exhibited in this 'museum' are various cultural relics like the eighth miracle of human beings, the Terracotta Warriors and Horses of the Qin Dynasty; China’s largest and best-preserved ancient City Wall; Drum Tower; Bell Tower; Giant Wild Goose Pagoda and Qianling Mausoleum, the joint burial mausoleum of the country's first and only Empress, Wu Zetian and her husband Emperor Gao Zong of the Tang Dynasty. Even natural scenic spots like Mt. Huashan and Mt. Lishan here have some fairy tales and historical stories behind them. Xi'an is also the eastern terminus of the ancient Silk Road, a road connecting China and the outside world in ancient times. Southern Shaanxi refers to the region south of the Qinling Mountains, which belongs to subtropical monsoon climate zone. Covered by mountains, valleys and plains, this region has beautiful natural scenery such as Nangong Mountain National Forest Park, Zhashui Cave and Yinghu Lake. As a part of the Kingdom of Shu during the Three Kingdoms Period (220 - 280), the central and western parts of the region were greatly influenced by Shu culture, hence boasting relics related to Shu, such as the Wuhou Memorial Temple and the Ancient Plank Road. Controlled by the Qin and Chu States in the Spring and Autumn and Warring States Period (770 BC - 221 BC), its eastern part belongs to the Qin and Chu culture zone. 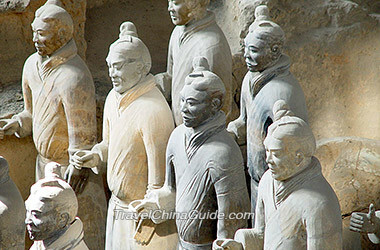 I want to visit Terra-cotta warriors going fro Beijing how would I get there? You are suggested to take bullet train from Beijing West Railway Station to North Railway Station first. Then take the direct tourist bus to the scenic area. which way is better to travel via beijing or shanghai to xian? Yes, actually, it’s not necessary for you to worry about the safety problem. You can tour around the city by yourself. Just don't wonder around alone in late night. If you wanna visit Wuzhen, you are suggested to start from Shanghai.From Shanghai, you can take direct coach from South Bus Station and arrive at Wuzhen. The bus schedules are 07:35 to 18:17. The ticket fare is CNY 51 per person. You are suggested to go to Xi'an from Beijing. Beside convenient direct planes, you can also take bullet train from Beijing West Railway Station. The duration is 5 to 6 hours. From Shanghai to Xi'an, only ordinary train and flight are available. But they are convenient as well. How many days you wanna stay in Xi'an? In general, you can use 3 days to tour around main scenic spots in this city. Where in China Is the Hanging City?? Hanging Temple is located at Hunyuan County, Datong City of Shanxi Province. 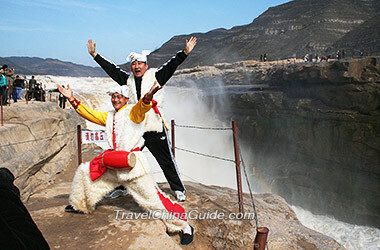 You need to reach Datong by air or train first, and then take coach from Datong Bus Station, and go to Hunyuan County. Then hire a taxi or share a private car with other tourists to arrive at the temple. I want to go Puzhouzhen from Xi'an. Please let me know how can i reach train or bus. You can take the bullet trains in Xi'an North Railway Station to Yongji North. Then hire a car to Puzhou. is there a place called Jinsixia Grand Canyon in Shangnan county,Shaanxi Province?